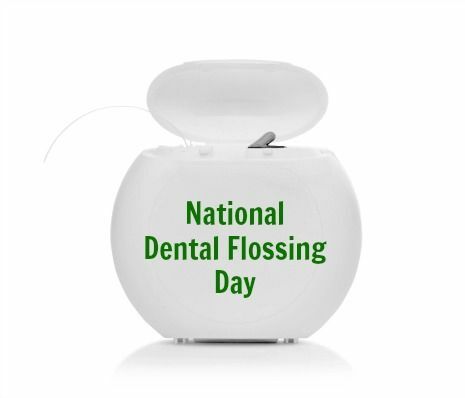 Dental flossing day is a national holiday. Who knew? According to the National Day Calendar, the day following Thanksgiving is National Dental Flossing Day. A perfect opportunity to write a blog post with a few facts and statistics about why dental flossing is important along with a list of available dental flossing options. Why is it important to use dental floss daily? Dental flossing daily helps to reduce bad breath, dental plaque, unsightly tartar (dental calculus), bleeding gums, and helps to prevent tooth decay. Brushing your teeth without flossing is like washing only 65% of your body. Food debris removed from between teeth that remains adhered to the dental floss contains more than 500 different species of bacteria. Lack of dental flossing is the primary cause (90%) of halitosis, bad breath. Avoidance or ineffective dental flossing often leads to gingivitis or gum (periodontal) disease. Left untreated, results in tooth loss. Not flossing can increase your risk for heart disease and Type 2 diabetes. Studies conducted by the American Dental Association have revealed that as few as 10% of Americans floss daily and more women than men use dental floss. When surveyed, 73% of Americans admitted that they would rather go grocery shopping rather than floss their teeth. The same poll revealed that 27% of adults are dishonest with their dentist/dental hygienist about how often they floss their teeth between dental visits. Americans spent close to $450 million dollars on floss in 2015. (Source: American Marketing Association). Floss and floss accessories (toothpicks, floss picks, etc) together account for 16% of yearly dental product purchases. close together making it difficult to slide the floss into the space, and others may have physical limitations like arthritis. Great news! There are a variety of options of products and tools to help you floss. I’ve included how to instructions below for traditional dental floss string. If using traditional dental floss frustrates you, there are other options listed below. 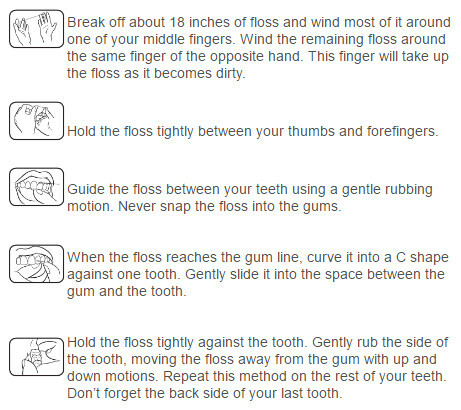 Instructions vary depending upon flossing tool. Feel free to ask your dental hygienist at your upcoming teeth cleaning appointment for personal recommendations and instruction. The dental aisle is filled with an overwhelming number of dental products. Some beneficial and some…not so beneficial. In addition to a toothbrush and toothpaste, a dental flossing product will help remove food particles that get stuck in between and below the gumline. Listed below are a few options available. Feel free to try a few from the list below or ask your dental hygienist at your next teeth cleaning appointment for a personalized recommendation. 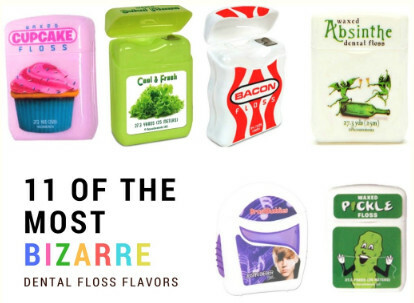 As I was researching statistics for dental flossing, I stumbled across a list of 11 of the Most Bizarre Dental Floss Flavors. Below is a screenshot from the article along with the link below..just in case you are interested. I listed the flavors below. While the flavors seem a bit wild for me…especially the cat food flavored one…let us know if you try one of these and what you thought. teeth and gums may impact a person’s immune response or risk factor for the onset of a serious health condition such as heart disease and/or even diabetes. Suffice to say that Dentistry for the Entire Family’s position is that dental flossing is essential to help prevent gum disease and tooth decay. Our team of professionals provide personalized oral health care counseling for each patient. Our team will discuss and demonstrate the best products or tools to try to help you too effectively clean the surfaces of your teeth and gums. For many, the solution is a combination of using an electric toothbrush, a inter-dental cleaner (floss included), and a fluoridated toothpaste. Updated 2018: Groom + Style blogger, Kellie Gardener, recently published an informative blog post that she wrote after performing her own research into the flossing controversy.